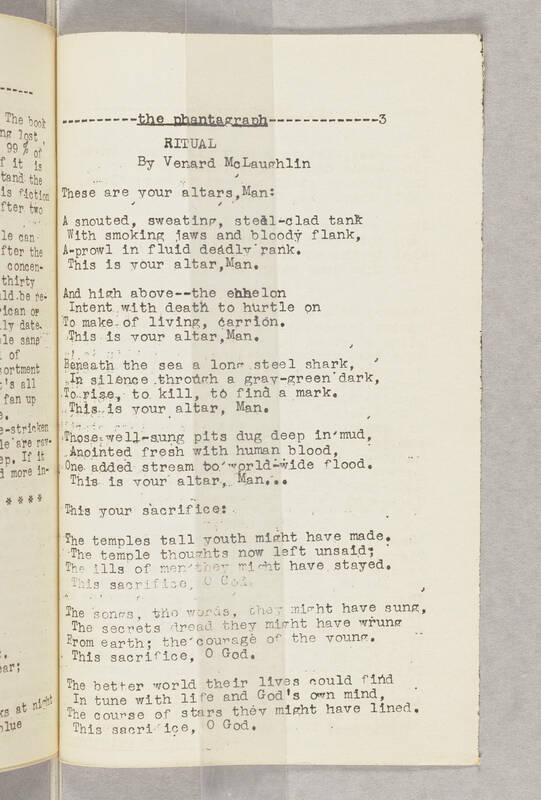 ------the phantagraph-----------3 RITUAL By Venard McLaughlin These are your altars, Man: A snouted, sweating, steel-clad tank With smoking jaws and bloody flank, A-prowl in fluid deadly rank. This is your altar, Man. And high above--the echelon Intent with death to hurtle on To make of living, carrion. This is your altar, Man. Beneath the [sea?] a long steel shark, In silence through a gray-green dark, To rise, to kill, to find a mark. This is your altar, Man. Those well-sung pits dug deep in mud, Anointed fresh with human blood. One added stream to worldwide flood. This is your altar, Man... This your sacrifice: The temples tall youth might have made. The temple thoughts now left unsaid; The lilies of men that might have stayed. This sacrifice, O God. The songs, the words, they might have sung. The secrets tread they might have wrung From earth: the courage of the young. This sacrifice, O God. The better world their lives could find In tune with life and God's own mind. The course of stars they might have lined. This sacrifice, O God.